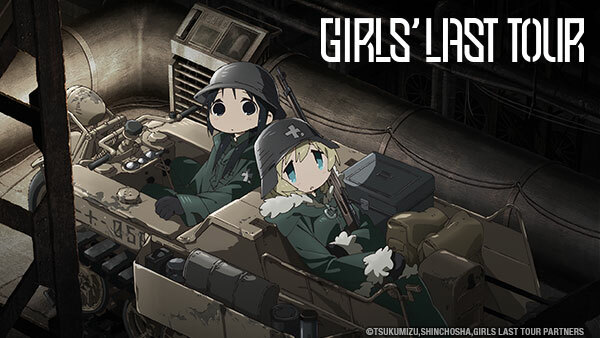 Sign up now to stream Girls' Last Tour, subs, tons of dubs, OVA's, simulcasts, plus the all new Dubcast℠ editions and more! Chito and Yuuri are fixated on using their photograph machine, but they can't seem to get it to work. As they travel, they find a long forgotten temple. Yuuri and Chito make it out of the dark cavern on their Kettenkrad but what will they find on the outside? Yuuri and Chito make their way through snow packed plains and begin to freeze. Will they be offered a reprieve from the cold? Yuuri and Chito meet another person after he almost accidentally kills them. Will they help him with his request? The girls continue to explore the ruins and they come across a house. Meanwhile, they take a nap which triggers some strange dreams. An odd person with some ambitious goals enters into Chito and Yuuri's journey. She is willing to help them but only if they will help her in return. Stuck in a labyrinth of pipes, the girls struggle to find their way out. Meanwhile, they look to make some food for themselves. What do they come up with? The girls continue their journey as they venture into the unknown. With heartfelt conversations, they find out more than they bargained for. The girls end up in a new facility where they meet a maintenance robot. With a fish and a lonely robot, they find the meaning of what it means for something to be alive. Yuuri and Chito explore the ruins of an old town and are left puzzled with the little relics that are left behind. As they continue their exploration, the girls run into some interesting creatures, and are left wandering an old weapons facility. The girls discuss their realization of loneliness but still have dreams of getting to the next level with an aspiration of reaching the moon one day.